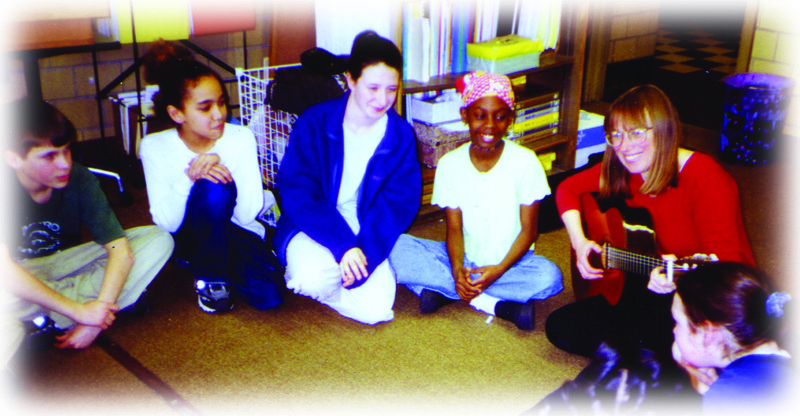 Fun and rewarding workshops for elementary school staff, based on social-emotional learning concepts and songs from Paulette Meier's CD: Come Join the Circle. Teachers are invited to listen, learn, sing along, share ideas, and participate in activities for teaching children concepts and skills in conflict resolution and social emotional learning. Participants will learn ASL interpretations for song choruses and will leave with many ideas for how to incorporate peacemaking songs and activities into classroom routines. Included in the fee are one CD and one songbook with notated songs. Mileage will be charged at 40 cents per mile for any distance beyond 30 miles round trip. Added costs per teacher for materials, if needed, will be negotiated with each school. For further information, contact Paulette at paulette@lessonsongs.com or call (513) 404-2700. Paulette Meier has over fifteen years working in the field of school based prevention. She has trained hundreds of teachers in Cooperative Discipline, Peacemaking Skills in the Classroom, and Strength Based Behavior Intervention Planning. She has also trained students in rural Kentucky, urban Cincinnati, and Austin, Texas in peer mediation, creative conflict resolution, cooperative learning, diversity appreciation and leadership development. Her songs have received highly favorable reviews in School Library Journal, Multi-Cultural Review, and Parenting Magazine. "Paulette's workshop was wonderful. I learned many new techniques for developing a cooperative classroom. Her passion and energy made it lighthearted and fun." "Staff who attended the professional development day with you are still saying how great it was. I can't wait to work with you further to nurture the culture of our school. - School counselor, Mildred Dean School, Newport, Ky.
"Paulette is an excellent trainer. After all is said and done, any program is only as good as the trainer. Paulette is a natural talent for this type of training."